Dining is one thing that always forms an integral part of our holiday planning. For both of us, Disney works as such a wonderful holiday destination: not only because of the vast amount of uniquely magical entertainment but also because of its ability to allow you to have pure adult indulgence in the evenings at some of its best restaurants - for some reason when you mention Disney's Restaurants to a lot of people they seem to think its turkey legs and pretzels and never see what the hotels can and do offer. We arrived at the Blue Zoo directly by boat from the International Gateway, the restaurant is easy to find from the dock. You first see the fantastic cocktail bar with its multi level booths, the bar takes up the entire length of one wall before it turns into the open kitchen area. Upfront at the side of the pass is a huge circular enclosed coal grill with various rotisserie skewer attachments, which are used to skewer whole fish at an angle and slowly roast them over the coals, these are the so called “flying fish” the signature dish of the restaurant. After this is the more formal dining area, with booths along one wall, windows on the other wall looking out over the dock if it was daytime. We are sat in a table for two which has a wall couch seat and chair, J notes later on to remind her not to sit on the couches as she finds they leave her a little low at the table and unable to sit back. She simply has to order the flying fish, which the waiter tells her will be whole sea bass. Perfect. It’s served whole and the chargrilling adds to the various flavours whilst keeping it moist and tasty. Im not sure what butter herb mix they used to baste it as it cooks but it really adds a nice taste along with the charred lemon zing. 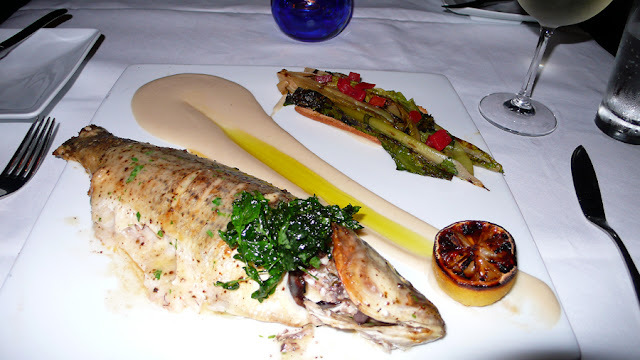 Among the accompaniments are a white bean puree, and grilled hearts of romaine and asparagus. An emulsion of lemon and capers has been set into the puree which gives a real lift and bite to the dish. 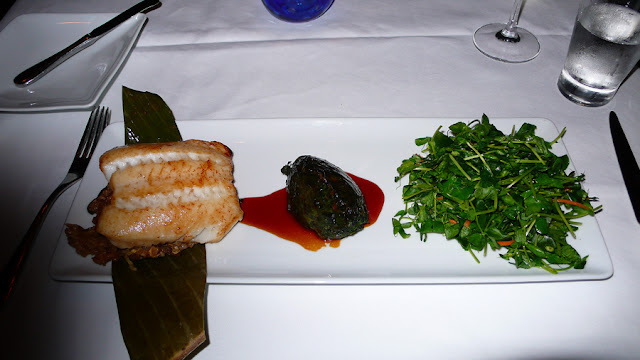 I would have chosen the same thing, it looked special the moment I saw it when we walked in but I decide to order the Miso Glazed Chilean Sea Bass (a larger meatier fish). This is a fusion cooked affair, something I sometimes regard with suspicion having been disappointed at some places by the result of this description; but our server describes it well, assures me its excellent and I take the plunge and order. This is served with warm sesame spinach and pea and mustard tendril salad. The fish is moist and transluscent with just a hint of the miso ( orange being the main flavour) - the sesame spinach contains more flavours of the east and would be edging over to the sweet side if it was not for the pea tendril salad whose dressing and the heat of those hot little shoots balances it nicely. It’s a dish that when put together works very well, however get the balance wrong, and it could go too sweet. I suppose that’s why fusion cooking can go so chop suey sometimes. Taking advantage of the fact (almost) every bottle of wine here can be taken by the glass, we decide to try out some Californian Sauvignons. To be fair there are perfectly great New Zealand Sauvignons to be had which would be just perfect with this meal; but - when in Rome. I try a mid priced from the Napa area whilst J tries something a little more expensive (yikes) from Sonoma. To be honest the Napa is just a bit too light and flowery with not enough acidity to tackle this dish so more Sonoma is ordered. The Sonoma is excellent just the right balance, pure gooseberry delight. 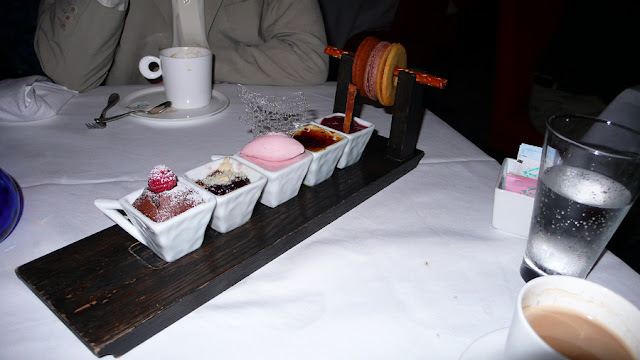 A platter of desserts is offered here which is made up of, sorbet, fig cobbler, vanilla crème brulee, chocolate raspberry molten cake, lemon cream sponge, strawberry confit and biscotti, wow! A fantastic meal in all and a great room - not to noisy, not too freezing with arctic AC and attentive but not in your face service . Best of all though delicious food with a fish bias - our favourite type of place.